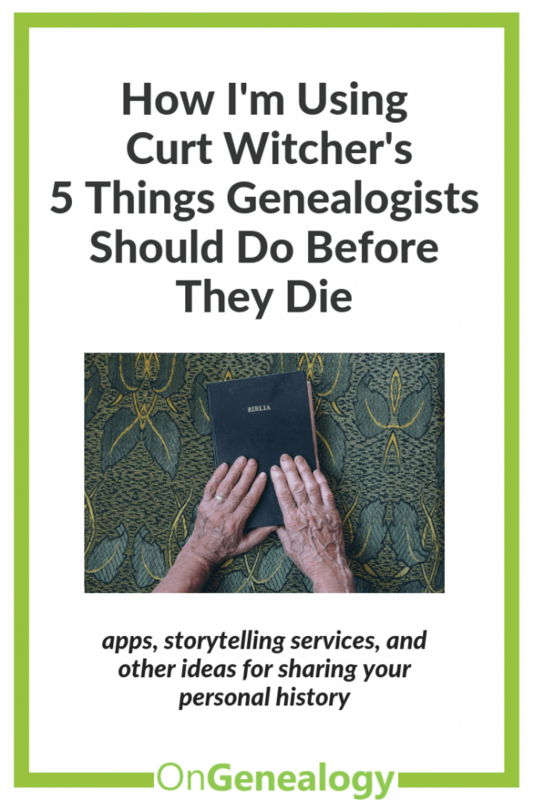 I attended Curt Witcher’s RootsTech class “Five Things All Genealogists Should Do Before They Die” because I looked over the handout and knew he was part of my tribe. He is the Senior Manager for Special Collections at the Allen County Public Library. Each of his bullet points is something I’m working on and care about deeply. He is a brilliant, engaging lecturer and has a lot of great ideas. I’ve written a couple of blogs about this and am carving some time in my weekly monthly schedule to record stories of my life. I’m writing episodic stories about specific events and then I’d like to create short Animoto videos to go along with the longer, written version. Both of my parents died young and I know it’s a real possibility to have your life cut short before you’ve had a chance to tell your own story. Getting started now, at whatever age you are, is a priority. It’s not egotistical or presumptive, just a thoughtful thing to share any experiences and knowledge you’ve gleaned with the next generation. If they throw it in the garbage, so be it; there’s peace of mind knowing you’ve tried to share what you have. I’ve also blogged about how to record other people’s stories and this is a passion of mine. Almost every time I’m listening to someone in conversation they say something interesting and I think, “this should be recorded.” I’ve focused on my own family and a few extended family members but I’m going to make the effort to record stories from some neighbors. Each time I talk to an elderly neighbor who has lived in our neighborhood her entire life, she tells me a new story about growing up here. It used to be all farmland and her father owned at least 80 acres – swallowing up our neighborhood and several more. Her hands are the hands of a farmer. Someone who has done manual labor her entire life. She milked cows most of her life. There is nothing delicate about her hands. I’ve heard her compare her hands to the well-manicured, smooth fingers of other women. Her fingers are twice as thick as most women’s fingers. I’d love to read the story of all she’s accomplished with her beautiful hands. I have a friend who was in the chaotic stage of raising 5 children while her husband’s roller-coaster work life left her doing most of the home-management. Her extended family would give her last minute, potluck dinner invitations and she was always assigned a dish to bring that took little prep and she bemoaned that they would never let her bring a layered jello salad. She said, “They always say it takes too much time; you won’t be able to prepare it with all those kids.” She was pretty worked up and almost yelled, “I know how to quick-set multiple layers of jello and make a great rainbow jello salad all the kids love and they don’t believe I can do it!” It was surreal at the time. I was a childless, working woman and she was a frazzled homemaker who had an unappreciated skill of making a jello salad most people don’t know how to make quickly. I could see how undervalued she felt. I didn’t particularly like jello salad or value that skill either, but it was part of who she was and it mattered to her, so it should matter to her family & friends. Her children are now mostly out of the home, she’s an entrepreneur with a published book and is successful outside the home, in places that are more publicly valued. But the one story I would want to record from her life is How to Make a Quick-Set Rainbow Jello Salad, and the story behind it. Curt Witcher says we’re at a crisis point where we’re losing family stories and research. People contact his library to donate things because they don’t know what it is or what the story behind a possession is, but it seems to have been valuable enough to save. He asked, “How many of us are family historians and how many of us are stuff gatherers?” We need to behave like true historians and organize our family treasures in meaningful ways. 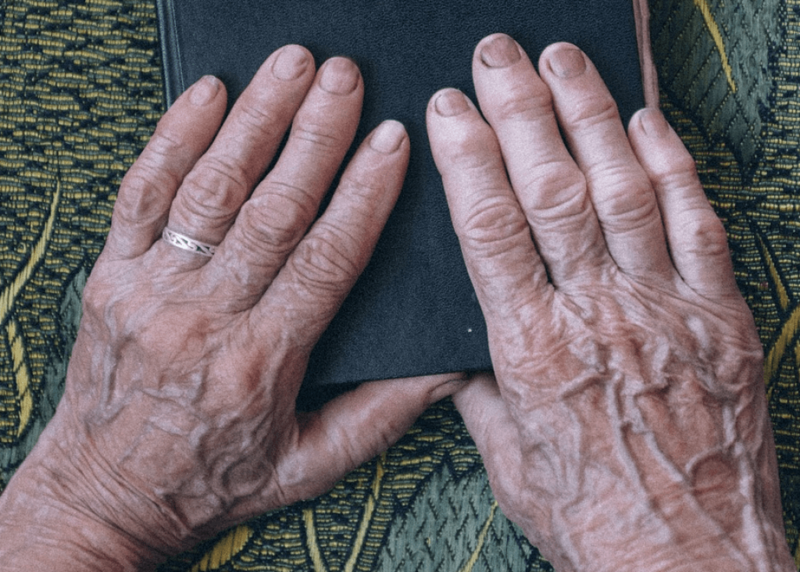 There’s never been an age when people had more time, resources, and technology to assist them in the effort to organize all that other generations have passed down. Let’s be the ones to bring order to the chaos. As I was digitizing a small roomful of family documents, old letters, scrapbooks, etc, I came across a small spiral notebook I dutifully digitized and in it, my grandmother was leaving notes explaining who was to inherit her various possessions. When it came to all the letters that her parents had written to each other and passed down to her, she said, “Don’t just burn these. Think about it before you throw it away.” She hadn’t known how to best preserve and share them before she died in the 1980s, but I know what to do. First I scanned every letter and envelope. Then I put the ones I wanted to keep in archival folders. Then I gave the other originals to a family member who wanted them. Then I made copies of the digitized letters, the entire collection, to each of my three siblings. Next, I’ll send a copy to my cousins. Then I’ll see if I can get people to help transcribe the letters. Then we’ll be able to search the transcribed letters and find topics that interest us. Our children and grandchildren will be able to read the text version even though they may not be able to read the old cursive originals. It’s a work in progress, but I’m living in the day and age when we have the solutions for what to do with all this “stuff.” He said we should spend at least as much time organizing our research as we spend in a library or online performing the research. We need to schedule organization time into our research plans. Curt Witcher said that every year, as a country (in the US) we create 1 trillion images. 😳We need to digitize old collections and then organize them in ways that will allow us to easily access them. I feel a twinge of guilt about this because a year ago I had 30,000 digital photos to organize and I barely made a dent during the year and now I have 40,000 digital photos. I’m using QromaTag to rename and add metadata to my photos but this process will take a long time. If you still have analog photos that haven’t been digitized, here’s a plan to scan those photos quickly. You definitely want the right tool for the job. There are companies you can hire to do the digitizing for you, but if you don’t have the money you may be able to access a free batch scanner and do the work yourself in a reasonable amount of time. Better just plan to start now and keep with it. Facial recognition programs that can identify someone from their mid-teenage years to around age 70. This technology can be used to identify people in unlabeled, old photographs. DNA testing for genealogy offers a new route to figuring out who our ancestors were. We can use our DNA matches to find a common ancestor and extend our family trees. Here are some new technologies I’ve either seen or tried, if you’d like to explore new options for your family history work. Animoto for creating family history slideshows – see Lisa Louise Cooke’s amazing Animoto deal that ends this March. This is the single, most important purchase I’ve made this year. RootsFinder – a new free family tree site with subscription offerings. Recently acquired by FindMyPast, you can build a tree for free, have unlimited hints, research logs, basic DNA tools, 2GB media storage, invite people to your tree, and use a WebClipper & ToDo Creator – all for free. Advanced DNA tools & more with a subscription plan. DNA testing and tools – when you’re ready to invest time into research and expanding your family tree, records and DNA sites are a valuable investment. I’ve tested with each of these companies and can see plenty of research leads. My personal plan is to finish more of my work with living family before I work with the dead but I check each site to make sure I don’t have any unexpected close matches because I’ve read about people deleting their accounts when they discover relationships they didn’t anticipate and I don’t plan to stalk anyone online but I’d like to at least know if any of those relations show up. Ancestry & AncestryDNA and their new ThruLines technology – I may have found my 6th great grandparents with ThruLines. I’m setting this information aside until I finish some work with living relatives. MyHeritage AutoClusters and Theory of Family Relativity – My husband has advanced his research with this new Theory of Family Relativity tool and I’ve downloaded & set aside my Autoclusters report to research common ancestors. totheletterDNA – DNA testing of old letters, at their RootsTech booth they said they’ve currently been able to extract DNA from letters as old as the 1960s and are hoping to go back further. There are so many companies and technologies popping up these days, and that was just a small sampling. It’s worth investing some time researching the newest methods before we try to tackle a job. If you ever have a chance to hear a presentation by Curt Witcher, I would highly recommend it. He’s very down-to-earth and has “boots on the ground” experience. Here’s a pinnable image below if you’d like to save some of these ideas to a Pinterest board. Best with your family history work! Great ideas! I need to be 20 years younger. Right?!? So much to do, so little time. Thank you for sharing! I wasn’t able to attend any classes in person. One program I’ve been getting excited about is Rootsfinder and their web clipper app. (Their DNA tools are cool too!) Their tree gets hints from more than 10 genealogy websites and with the web clipper and access to those sites, you can attach thumbnails, data, and make extensive notes far easier than other online trees do. Thanks so much for the info, Clorinda. I haven’t tried their site yet so I’m glad to hear from someone who has and to learn it’s got such great new tools. I’m adding it to the list of new technologies. This site contains opinionated comment. Some listing authors, bloggers, commenters, or reviewers may be professionals in some field of study but they are not acting in a professional capacity while posting on this site and the information shared on this site is for general informational purposes only. Reading this site does not create a professional relationship with the reader or user and any author, blogger, commenter, reviewer, or site owner. OnGenealogy.com and any author(s) are not liable for any losses or damages related to actions or failure to act related to any content on this site. 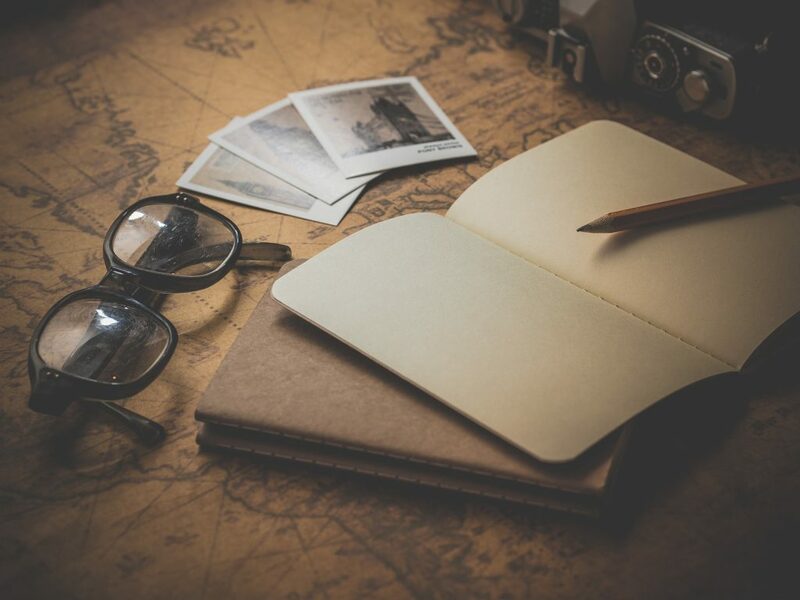 OnGenealogy.com and any author, blogger, commenter, or reviewer will not be held responsible for any damages as a result of reliance on information on this site. They will also not be responsible for errors, mistakes, or omissions on this site. Users rely on the information contained on this site at their own risk.